Fletcher Opera Theater, Raleigh, North Carolina, on March 8, 7 pm. 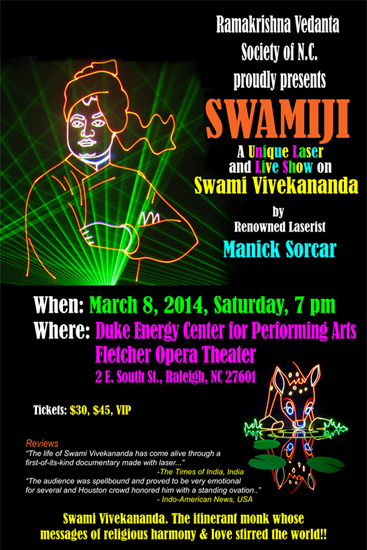 A poster used for Swamiji laser show at Raleigh, North Carolina. The Duke Energy Center for Performing Arts, Fletcher Opera Theater, Raleigh, NC. "....A century later and more (after Swamiji's speech at the Parliament of World's Religions), we live in a world today where sectarian violence and wars between world’s dominant religions inter-mingled with political demonism continue to cause bloodshed, destroy lives of innocent children, men and women, destroy families, disenfranchise communities and bring unbearable miseries to humanity. At the root of this carnage is 'religious intolerance' which he foresaw like a prophet and spoke out against it at the world stage. The world today needs to follow what he said 120 years ago for a universal brotherhood and global citizenry that could live in peace and harmony through tolerance and acceptance. It is our small effort to bring out his message once again to as many people in our community as we can by staging this show"